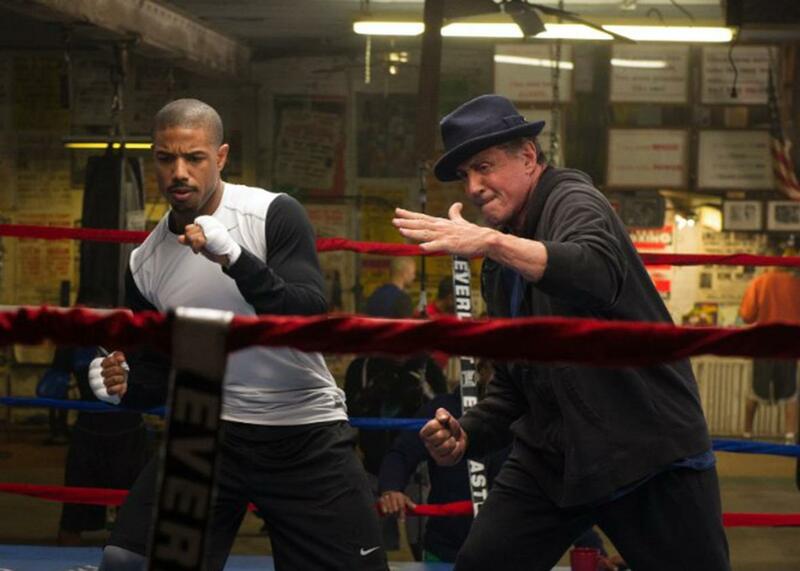 Creed, Ryan Coogler’s Rocky update, starring Michael B. Jordan and Sylvester Stallone, reviewed (VIDEO). Ryan Coogler’s installment in the Rocky franchise is an invigorating crowd-pleaser. Michael B. Jordan and Sylvester Stallone in Creed. Photo by Barry Wetcher. Warner Bros. Entertainment Inc. and Metro-Goldwyn-Mayer Pictures Inc. It was weird news, a couple of years ago, to learn that Ryan Coogler would helm a Rocky spin-off focusing on the son of Apollo Creed. Coogler made a name for himself with his impressive feature debut Fruitvale Station, a self-assured meditation on the last day in the life of a black man in America—why would he want to follow such a provocative, sobering film by contributing a generic sports drama to an aging, battered franchise? I was intrigued to see Coogler reuniting so quickly with his Fruitvale Station star, the promising Michael B. Jordan, but it was hard not to feel as though they both deserved better material. Cue montage! (Coogler writing furiously, Jordan training, both of them on set.) Cut to the present day: Some of Coogler’s (white) peers have jumped just as quickly from the indie scene to multi-million dollar franchises even bigger than the Rocky series; one of them, Josh Trank, directed last summer’s most notorious flop, Fantastic Four—also starring Jordan. We don’t need another Rocky any more than we needed another reboot of a superhero franchise. But if we’ve got to have more Rocky, why not involve two of Hollywood’s most likable rising stars of color? And maybe, just maybe, Coogler—who co-wrote the film alongside Aaron Covington—could find a way to reinvigorate the genre. Creed begins in 1998, when Adonis Creed is an adolescent in juvie with a natural talent for taking on kids twice his size. One day, a woman (Phylicia Rashad) comes to visit him, revealing that she was married to his late father—the boxer, once played by Carl Weathers, who defeated the hero in 1976’s Rocky and later befriended Balboa—and wants to take him in. By the present day, Adonis (Jordan), when not working a nondescript finance job in L.A., is winning amateur boxing matches in Mexico under the last name Johnson. (Throughout the film he refuses to tout that he is Apollo’s son, insisting that he make it on his own.) Upon receiving a promotion, he promptly quits to pursue boxing full-time, and moves to Philadelphia to seek out the guidance of legendary Rocky Balboa (Sylvester Stallone). Rocky is hesitant at first, but Adonis eventually wears him down, convincing him to help him train to take on the undefeated champion of the world, British fighter “Pretty” Ricky Conlan (real-life pro Tony Bellew). All of the bones of the inspirational sports drama are present: The scrappy upstart with unwavering determination and a whole lotta heart; the fading legend who long ago resigned himself to old age and loneliness; the mouthy champion who is the Goliath to the scrappy upstart’s David. Indeed, switch out Stallone’s iconic character in Rocky for Adonis and you’ve essentially got Creed. (There are tons of callbacks to the franchise for die-hard fans, including a chicken chase.) But it’s also clear that Coogler and Covington work hard to break through the clichés and make the boxing movie a little more interesting. Take the character of Bianca, played by Tessa Thompson (Dear White People). Because no tale of a would-be champion is ever complete without a love interest, Creed supplies Adonis’ Philly apartment with a gorgeous neighbor. But Bianca is revealed to be very much her own person, with her own colorful background and career as a local musician. Of course, by the end of the film, she fills that supportive girlfriend-on-the-sidelines role, but she’s a far cry from Talia Shire’s meek and insecure Adrian in the first film. Where Creed TKOs most other sports dramas, though, is in Coogler’s direction, Maryse Alberti’s cinematography (she also did The Wrestler), and the editing of Claudia Castello and Michael P. Shawver. My god, the training montages! Anyone making a Rocky movie in 2015 must grapple with this requirement, the series having made such montages both iconic and clichéd. Creed’s montages (and I counted no less than three) are masterfully crafted, each one building upon the last. They provide the perfect melding of music (a combination of hip-hop bravado and swelling movie orchestration), rejuvenating imagery of an impeccably sculpted body at work, and no shortage of emotional investment, thanks to the truly galvanizing filial dynamic between Stallone and Jordan. In these montages, Coogler goes big, and the results are nothing short of inspiring—and I write this as someone who rolls her eyes at the tropes of sports dramas. I feared signing on to Creed might derail Coogler’s and Jordan’s careers. Instead, this revitalizing crowd-pleaser solidifies my belief that these two have the potential to create really great art. I still hope this ambitious and talented director returns to original storytelling sooner rather than later, but if he decides he’s next going to remake, say, Saturday Night Fever? I won’t be so quick to judge.